i have seen this called the Foxes Path and the Goat Path. Does anyone know how easy this path is to find from the Crib Goch North Ridge end? I have seen a few descriptions from Bwlch Y Moch, but none from the North Ridge. I have previously descended the North Ridge into Cwm Glas Mawr when reversing Crib Goch, but wasn’t aware of this path at the time. Reports vary but I would expect a lot of difficulty if you're not very familiar with the cwm (we've never walked that path ourselves). Peter Hermon describes that path from the Bwlch y Moch end in his book as "...a faint trail, little more than a sheep track but well cairned...", but I've heard other reports of total failure to find it from the other end and subsequent attempts to navigate the pathless terrain. One of the latter gives a grim account of ending up on a traverse of very steep and precarious ground, and that's without the added potential problem of thick mist on the day. I have descended from North a Ridge into Cwm Glas Mawr previously, but dislike the walk down the road to Nant Peris. I was hoping to use this path to get to Pen y Pass and then the PYG in order to use the Miners’ Path to gain access to The Glyders. This would have the advantage of missing out the road and the slog up Elidir Fawr. I have gone up this way several times before and have no burning desire to repeat it. I was wondering if I would need to traverse around the end of the ridge to find the path, or if there is a descent direct from the ridge. Of course, I could descend the east ridge, but that doesn’t greatly appeal. This topic is of interest to me because I attempted the route several years ago, and failed. That could almost be me that vghikers wrote about above! Firstly, the name: I have a collection of book references, snippets from articles and web links about the route, half of which call it the Foxes or Foxs Path and the rest call it the Goat Path, so take your pick. Further confusion is caused by there also being a Fox's Path on Cadair Idris. If you go eastwards from Cwm Glas towards the North Ridge there is a distinctive 'notch' in the ridge to aim for, and while there is no path it is easy walking on grassy terraces. East of the ridge, though, all I found was a faint little sheeps trod (or goats!) that soon disappeared. However, there was a trip report six years ago http://www.walkingforum.co.uk/index.php?topic=18644.0 that included near its start a photo showing a very clear path at the Bwlch Moch end. If I can get fit enough, I will hopefully have an attempt on the 3000s next year and will be descending the north ridge into Cwm Glas Mawr. If I make it there I will keep an eye out to see if I can spot the path. 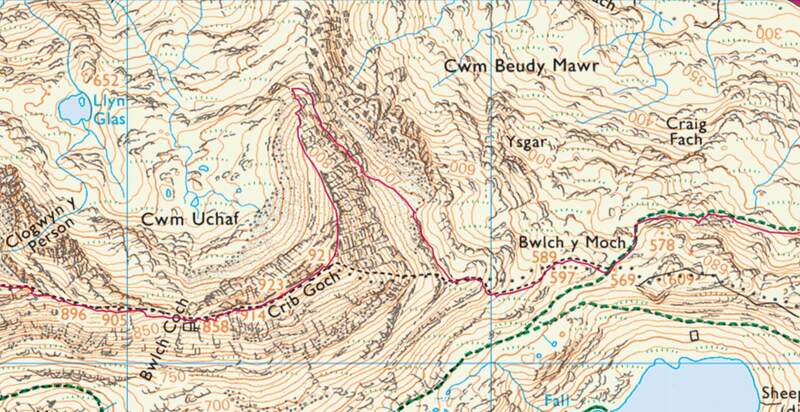 From Pen-y-pas, take the usual path for Bwlch y Moch and take the right-hand fork for Crib Goch. At grid ref SH 62886 55225, take a feint path off to the right and head for a distinct outcrop on the skyline ahead for the start of north ridge approach to Crib Goch. Thanks Glyno. I am going to be descending the North Ridge, so want to find the path fr9m the opposite end so that I can return to Pen Y Pass. Do you have any hints for this direction? This is a screenshot from a tracklog, may be of help? May I be the first to thank you for your information, Glyno. The route on the map you posted shows what I expected from your earlier description of it. All the accounts I read before I attempted it said that you contour around the slopes from the 'notch' on the North Ridge to Bwlch Moch, which I can now see is a bit misleading, for I tried to take a more direct route from one to the other rather than turning sharply back parallel with the ridge. If I had overcome my nerves and succeeded with my wrong way I would have overshot Bwlch Moch anyway (which wouldn't have hurt, though, for I was headed for Pen-y-Pass). EDIT: I looked again at the information I had, one of them says the path goes around the mountainside at around the 1,400 feet contour, 427m in today's money, which if you look at the map is quite inaccurate. Thanks Glyno. That gives me an idea of where the path leaves the ridge. The biggest at the moment is not route finding, but fitness. An Achilles‘ tendon injury followed by the recurrence of an old back problem has kept me out of action for 4 months. It looks like it will be quite important to find the correct route. It could be a bit tricky straying off line. I could be wrong but I think that shot makes it look steeper than it actually is! Certainly steeper than I recall from memory. Following your comment, I looked at a few other locations I am familiar with on Google Earth. It does appear that some locations can look steeper than they appear on the ground. Even quite close by, the descent from the North Ridge into Cwm Glas Mawr looks more difficult than I remember it. It seems that the magnification and angle selected in GE may distort the perspective.